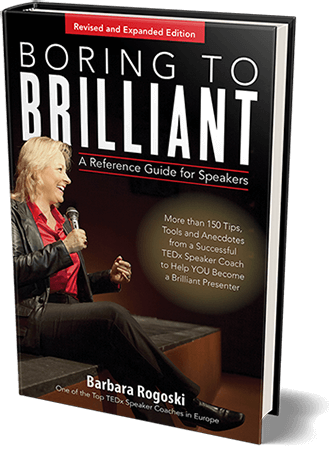 Buy the Hardcover “Boring to Brilliant, A Reference Guide for Speakers” | Boring to Brilliant! To buy your hardcover copy of “Boring to Brilliant A Reference Guide for Speakers” for only €29.95, click on red the button below. If you want to buy more than one copy, you can change the number in your Shopping Cart. Pre-launch offer: Order the hardcover or the paperback now, and we’ll send you the ebook for free! » European Sales Tax (VAT/BTW) is included in the price. » The base shipping cost is €4.00. » For each additional book, you will pay €2.00 more. Click the button below, if you want to buy the hardcover book. If you’d rather buy the paperback click here. buy 5 hardcovers and get a hardcover free!